client it is essential that you settle this debt without delay. Payment should be submitted in full within 7 days or contact made with this office immediately, by telephone or letter, with your payment offer. 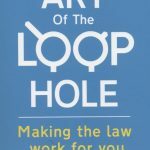 Failure to contact us by 30/09/11 may result in legal proceedings being issued against you without further notice. 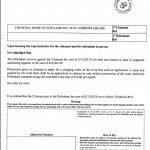 We would draw to your attention that if judgement and an order for repayment in full is octane and remained unpaid, the following enforcement options are available and may be considered by our client. Warrant of execution by bailiffs against goods owned. Application for attachment of earnings order with your present or future employer. 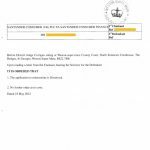 Application for a charging order on your property you may owe or are purchasing under a mortgage. (Where the balance outstanding is of a sufficient level). We would emphasise that should judgement be entered against you this may affect any future credit application you may make elsewhere. We would also draw to your attention that all legal costs incurred in this situation are usually payable by the debtor. The above balance includes an administration cost of £37.72 which has been added to offset (some of) the costs incurred by our client. If you contact us by 30/09/11 we may be able to reduce the administration fee payable. 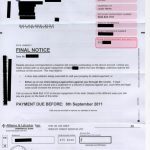 If you are starting to get this type of letter from the creditor, then you really should act now! The longer that you leave it the worse the situation will get. Also be aware that what is a small debt now, can be much larger in the future! Don’t leave it, do something NOW to sort your debts out. In this particular case the person involved will be going into a debt management plan (DMP) as this is the best solution for them. Never make contact and never pay up, this has been my practice for over the last eight years, for them to no avail, not a penny, also a doorstep collector did come, left their name, and I have since found out where they live, now it’s my turn to harrass them, and I’m looking forward to whats coming to them. 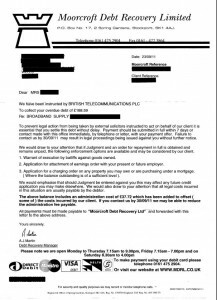 My advice to people receiving these letters from Moorcroft Debt Recovery is that you should first call Moorcroft and ask for some proof of the debt owed, further to this I would strongly suggest that you contact the supposed original debtor. 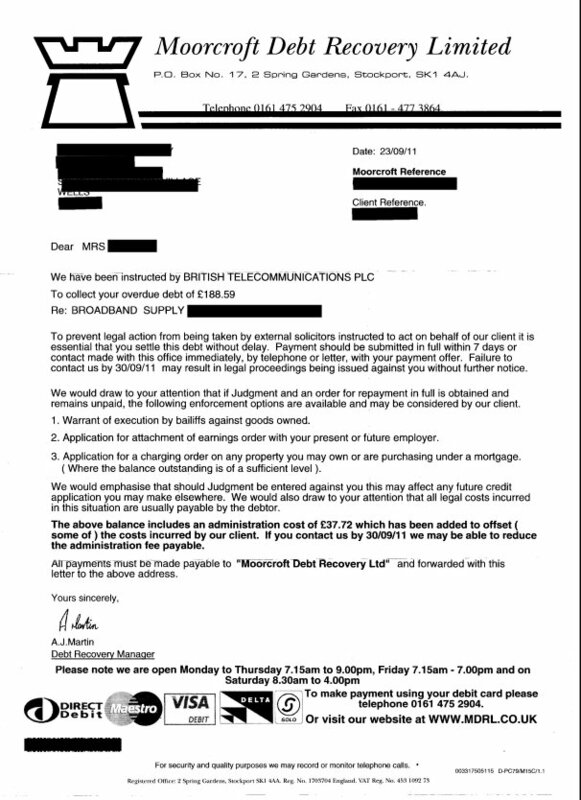 I have been contacted 3 times by Moorcroft with fraudulent claims for money, they have claimed that I owe money to BSkyB, Orange and Lloyds TSB. All 3 times the amount was around £200. All 3 times I found that the claims for money were all completely incorrect and I believe that Moorcroft are targeting people specifically. I feel sorry for the doorstep collectors as it is not their fault they are provided incorrect information.